I'm in Montreal, Quebec right now. 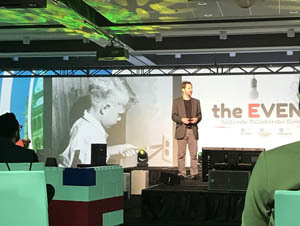 Earlier this morning, I was onstage at the Bonneventure Hotel, giving a keynote talk for something called The EVENT. Its a conference for event planners, who have gathered here from around the country. It was a lot of fun to be involved with this... Sharing my stories and experiences with the audience. I fly back home to Toronto this afternoon. The program I worked on last year "The Weather Files" is now broadcasting on The Smithsonian Channel. 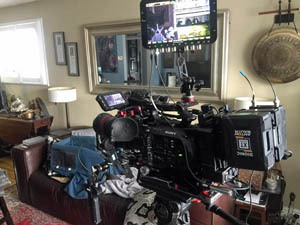 The program, which was also airing in Canada on Cottage Life TV, features people who work in extreme weather and contains interviews, real footage, as well as some dramatic recreations... It's a bit weird to see an actor playing me on TV for parts of this. Cool, but weird. The past few days have been an absolute blur. I don't know where to begin. The Explorers Club Annual Dinner was the biggest ever held, with almost 1700 people in attendance at the Marriott Times Square Ballroom. 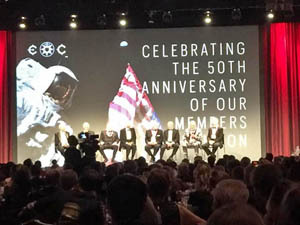 The theme this year was a celebration of the 50th anniversary of the Moon landing. 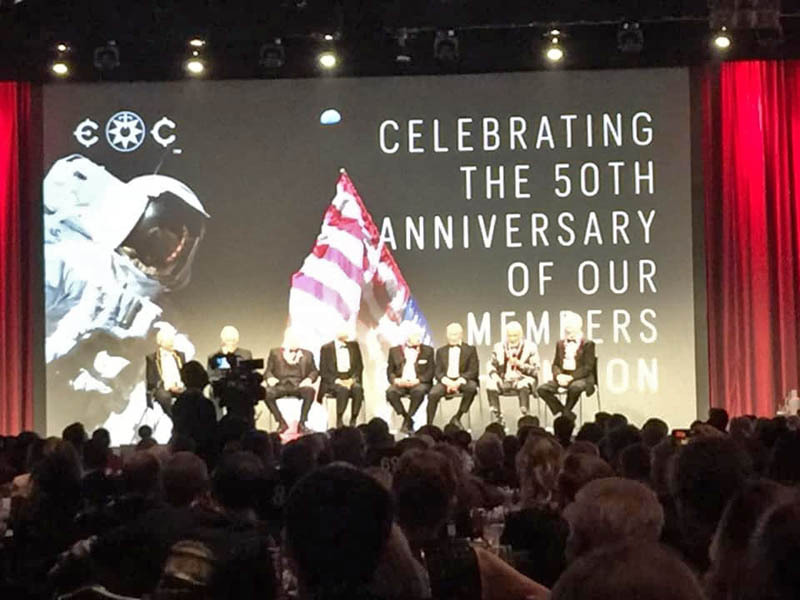 In attendance were 8 Apollo astronauts, including Buzz Aldrin, and Michael Collins from Apollo 11. Hearing their stories was fascinating. I hope we get people back on the Moon again soon. 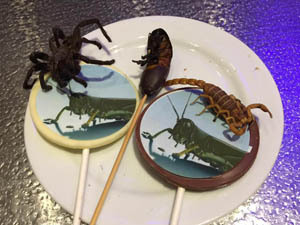 - Snacking on exotic foods such as tarantulas, cockroaches, scorpions, iguana, and jellyfish. These odd foods have been a tradition at ECAD for decades. - I got to meet Her Excellency the Right Honourable Julie Payette, Canada's Governor General, and a former astronaut herself. - Hanging out with so many incredible people, seeing new friends, making new ones, all who are incredibly accomplished. - There were so many excellent presentations at the open house at club HQ on Sunday. The place was packed! - I got to spend a bit of time with Apollo 9 astronaut Rusty Schweickart. An amazing guy, who is currently working on systems to protect Earth from asteroid collisions. - I was able to spend a few nights with my frequent storm chase partner Scott McPartland, and his wife Cecilia. They graciously let me stay with them when I visit New York. It's impossible to summarize how outstanding ECAD weekend really is. I will always endeavor to be there, when I can. 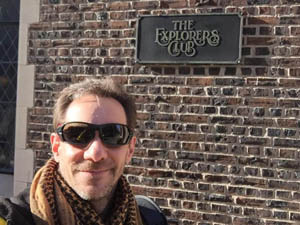 I flew to New York City last night for my annual pilgrimage for The Explorers Club Annual Dinner. This is the event that I was emcee for last year. It is considered to be the "academy Awards of Exploration". The big event isn't until Saturday, but between now and then I have Chapter Chair meetings, board meetings, special events, dinners, and a bunch of other things over the next few days. It is so great to be back at the historic headquarters of the club. There's just so much history surrounding this building. I just know that by Monday when I fly home, I'll be exhausted, and will have no voice left, and I wouldn't want it any other way. March 10 2019 - Vanuatu Lava Lakes Obliterated! What a great evening in Toronto. 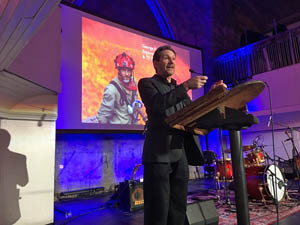 I was invited by the Royal Canadian Geographical Society to give the keynote talk at their GeoGala fund raising event in Toronto. Last year, I was the Master Of Ceremonies, and fellow "Explorer In Residence" Adam Shoalts gave the keynote. This year we reversed roles. There was a great dinner, many great items up for auction (including several trips), the keynote talk, and Canadian roots-rock band The Skydiggers provided live music. A great time was had by all, and we raised a bunch of money for the society. thank you to everyone who attended! Extremely strong winds from a deepening Texas Low brought hurricane force gusts to the eastern end of Lake Erie. these winds pushed thousands of tons of ice up onto shore in a phenomena called an "Ice Shove". 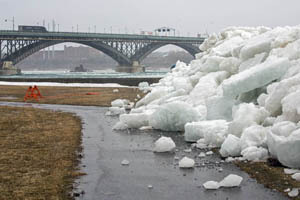 I was out documenting the event in the towns of Crystal Beach, and then eventually at Fort Erie, where the ice was dramatically being pushed ashore, over the breakwall, into the adjacent park, and onto Lakeshore Road. At one point, the ice pushed up quickly, and we had to dash to get out of the way as the ice crashed towards us. It is astonishing how fast the ice conditions can change. 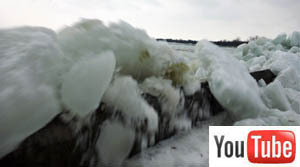 Be sure to check out the dramatic video of the ice crashing towards us. 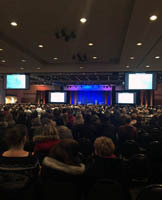 It was an absolute pleasure to speak at the Calgary City Teachers'Convention today. 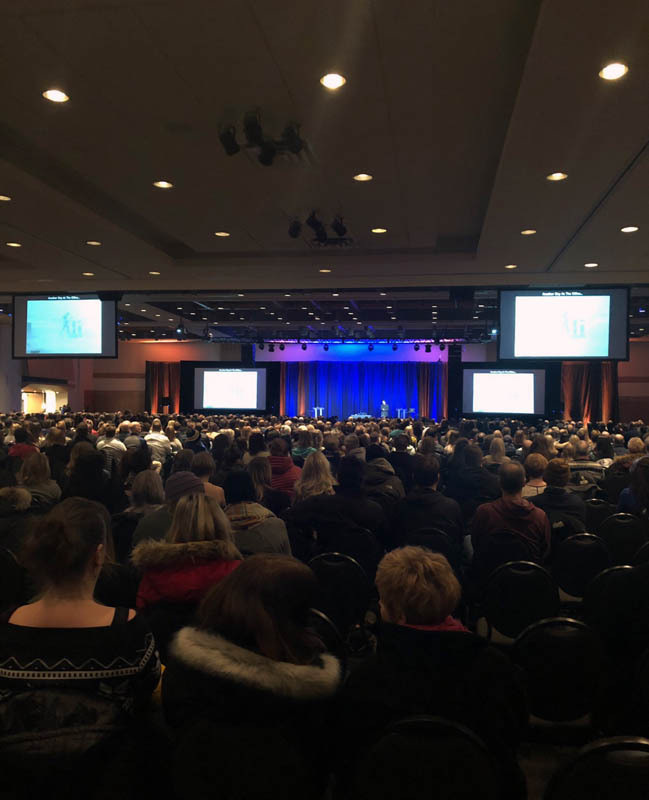 I had the privilege of giving the opening keynote talk for the 2 day event, which is the largest teachers' convention in North America. I had almost 2000 people in the audience for the talk. If you look closely at the picture, you can see me there, up on stage. Now it's time to fly back home from Alberta. I spent most of today in front of the camera, shooting interviews for a TV project. More details later when I know more about broadcast dates etc. North America is in the grip of another polar vortex, a dome of cold Arctic air that has descended down from the north. Many cities have been experiencing frigid temperatures, and bone-chilling wind-chills. In Toronto, it has been freezing cold as well, with temperatures diving down below -20. Of course, with temperatures that cold, a lot of people were outside demonstrating the effects of the cold. The most popular of these demonstrations is the old "toss boiling water into the air and watch it instantly turn to snow" gag. Instead of doing that, I whipped up a quick batch of ramen noodles and left them outside for a brief period. 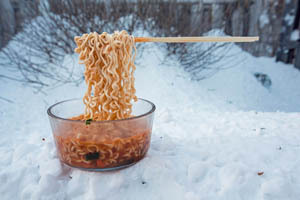 The water froze quickly and the chopsticks were held, suspended in the air by the frozen noodles. It's a fun trick that anyone can do at home in really cold weather. I highly recommend trying this with kids. 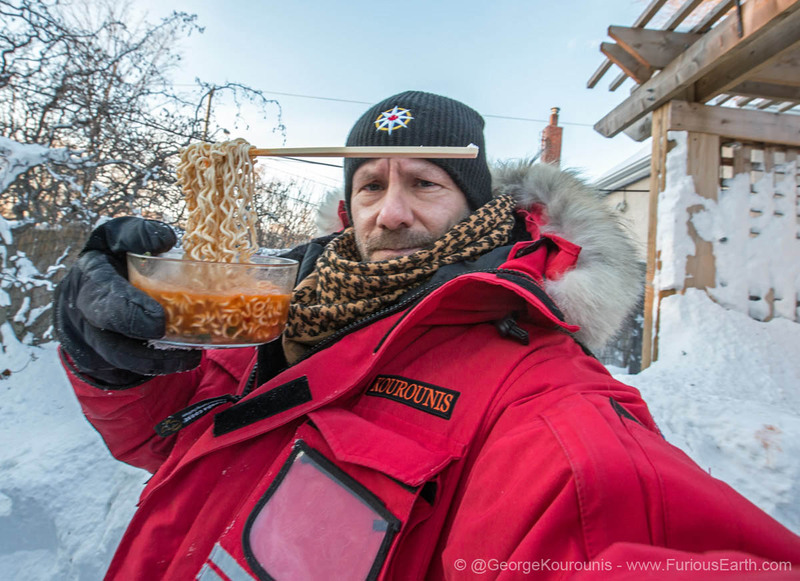 It's fun, safe, and afterwards, you can thaw the noodles out and eat them! An Alberta Clipper, combined with lake effect enhancement created chaos in Toronto, including a full shutdown of the Don Valley Parkway, the main north-south artery out of downtown. At first, I was teamed up with The Weather Network to help report on the storm, but on my way home afterwards, I found myself caught up in the middle of the highway chaos. It was like a post-apocalyptic scene. 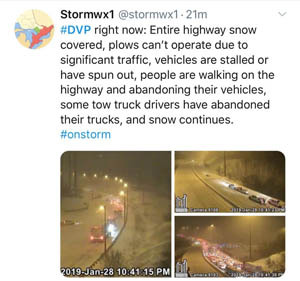 Snowplows couldn't clear the highway, people had run out of gas in the gridlock, cars were abandoned, and people were walking on the highway. I was also experiencing car battery trouble in the middle of it all, so I was struggling to keep my car from stalling. It was like a scene from a move. In total, between 33 to 38 cm of snow came down in the metropolitan area. 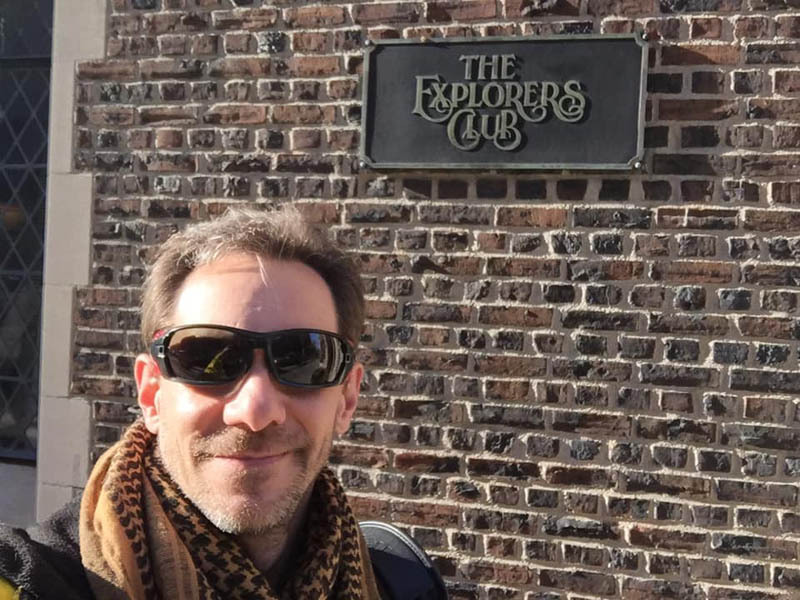 Jan 26 2019 - Come Join Me On The Silk Road !! Here we go... Come join me on the Silk Road adventure of a lifetime! July 20 - Aug 11 2019. Three weeks overland, crossing Turkmenistan, Uzbekistan, Kazakhstan, Tajikistan and Kyrgyzstan. 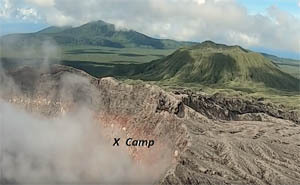 This will be my first time returning to the "Doorway To Hell" flaming gas crater since my Nat Geo expedition there, and you can come along! We begin there, then cross all of the former Soviet 'Stans! This is going to be a real adventure. Special thanks to Exodus Travels. Whenever it gets really cold, I go down to the shore of Lake Ontario, to photograph the sunrise over some very cold and steamy water (It was -12C with a wind chill well into the -30's today). Today, the steam was OK, but the cool thing I found were these "Ice Teardrops" or "Ice Turnips". They form when icicles reach a body of open water that has gentle waves, as each wave passes over the icicle, it adds a layer of water that freezes in the frigid air. I'm always amazed at the shapes that ice can take on. 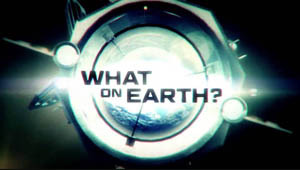 Watch for me on season 5 of What On Earth? on Science Channel. The new season starts airing Tuesday, Jan 8th at 9PM EST. We investigate bizarre and unusual things spotted on satellite imagery. 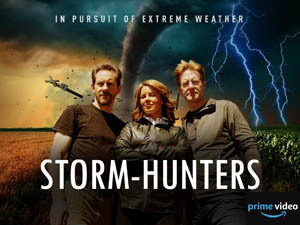 Six episodes of the Storm-Hunters TV show that I sometimes co-host are now available on Amazon Prime Video. The program is produced by The Weather Network in Canada, but now, thanks to the streaming service, it is available in the U.S. Canada and the U.K.
To watch, head over to the Prime Video site and search for the show. (Amazon Prime Subscription required).